I realize I haven’t gone near my “DIY, Packing, and Storage” category in a loooong time, so I thought I’d share this cute DIY idea with you. I made this “where we’ve been” collage for my boyfriend for Valentine’s Day, but it would make a great gift or decoration for anyone! 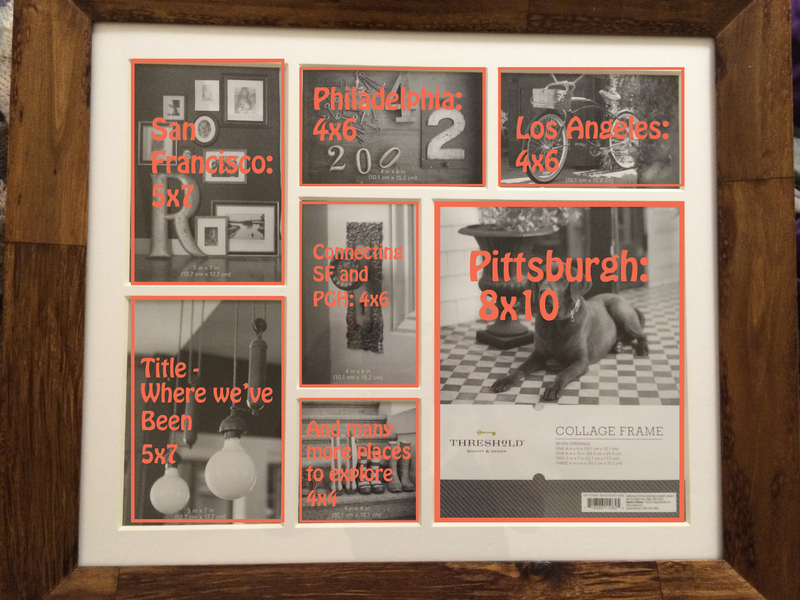 I found this Threshold Wooden collage frame from Target. I wanted one that had different sizes so I could feature special places like our home cities, and I wanted one with more slots than places we’ve been, so we have even more motivation to travel! Now that you have your frame and your plan, it’s time to get to work. This part can be the most difficult because you want to find all of the cities on your list, but you want the maps to all look similar. I ended up finding state maps of the same brand at my local Barnes and Noble for $6 each. State maps can be handy because you can cut out more cities to save in case you ever travel there, and you often get a couple of different sizing options for your cities that you wouldn’t get with a city map. The only tricky thing is that the maps are double sided (for California N/S, and for Pennsylvania E/W), so you have to make sure your cities don’t overlap. Unfortunately, the Pittsburgh and Philadelphia region maps were right behind one another, but since each city is also featured in the large main map on each side, I didn’t have to buy a second one. Make sure you look out for this when purchasing your maps, or have online options as well! Trace where you’ll cut from each map and cut them out very carefully. Now for the part that makes me the most anxious: cutting the cities out. You’ll want to measure the correct size either with a ruler or the insert you’ll be putting the maps into, making sure to leave some extra space around the edges. Once you’ve measured, you want to cut them out. I used scissors to cut out the sections, making the maps much easier to work with, and then used an x-acto knife for the more exact outlines. A knife isn’t necessary, but it will cut cleaner and you won’t have to cut through the map unnecessarily to get to the middle. Plus, you can cut along a straight edge for a perfect cut. The collage part of my frame was just an insert, which makes this last part super easy. All I did was open up the back of the frame, pull out the insert, and tape them to the insert itself. If you’d rather not use the insert for this, you can tape or glue your map pieces to a separate surface like card stock. Trace your insert onto it so you can place your map pieces perfectly the first time. I used some extra map pieces as a background to the three places without a city. Put it back in the frame, and you’re done! BONUS: Make a card with the leftover map pieces. I learned to make this type of card a couple years ago and already gave my boyfriend one like it before, but it’s so easy to do and works really well with scrap paper. Cut any shape out of a thick piece of paper. This will be the outside of your card. I had a booklet of foiled card stock which works perfectly for this. Make sure there are no more cities you want from your maps and cut the extras into strips. You’ll want to make them a bit wide so you can fold them in half. This will give your design nice, sharp edges. Put the “stencil” you made face down. Then, take your first strip, fold it in half, and lay it over one edge of your design. Cut it down so it doesn’t stick out of the card, and tape or glue down. 4) Repeat, working your way around the design. You’ll want to turn it over periodically to make sure your lines are straight and that you like how it looks. Stop when you have a teeny little window left in the center, and cover it with any paper you want. 5) Cover the back side with a piece of paper or card stock. This is where you’ll write your message! I decided to cut the card down so it could be more of a gift tag rather than a card. I hope you liked this project. Let me know if you like DIYs, and I’ll do my best to show you some more! This is adorable! I ordered my husband a picture of the night sky from the night when we got married. This would look awesome with it! That sounds like a beautiful gift! Thanks so much for reading and commenting. Absolutely wonderful! I love this! I am going to have to do this! Thanks for the great ideas! Thank you! I hope you try it out. It was a lot of fun and doesn’t take too long (unless you’re stopping every two minutes to take pictures, of course! ).